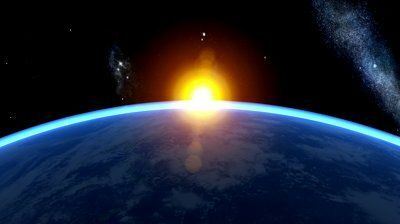 The Perseid Meteor showers peak this week - with approximately 100 "shooting stars" per hour - on late Wednesday night/early Thursday morning, August 12th-/13th﻿﻿. Set out a lawn chair and sleeping bag and plan to spend the night outside. Be sure to bundle up, it's cool at night this time of year! 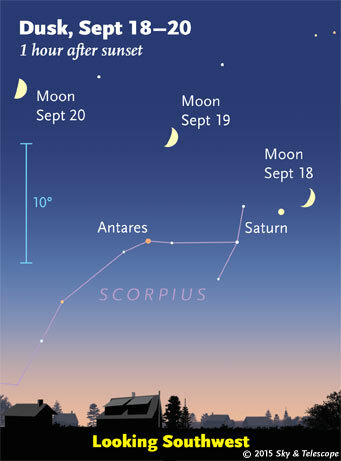 The Perseid shower should peak late this Wednesday night, August 12–13. 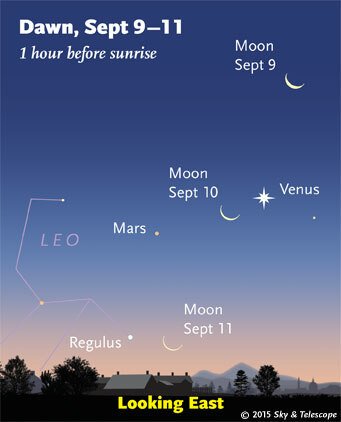 The sky will be moonless. 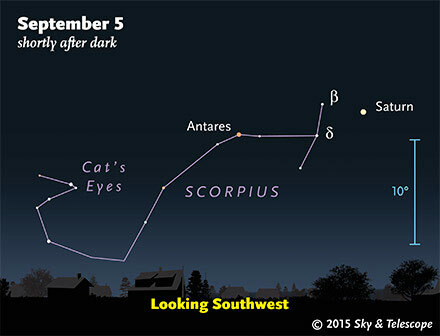 - See more at: http://www.skyandtelescope.com/observing/sky-at-a-glance/this-weeks-sky-at-a-glance-august-7-15/#sthash.gdN5dlOc.dpuf﻿The Perseid Meteor showers will peak - with approximately 100 "shooting stars" per hour - on late Wednesday night/early Thursday morning, August 12th/13th. For the best experience, get a lawn chair and sleeping bag and plan to sleep outside! Bundle up, it's cool outside this time of year. 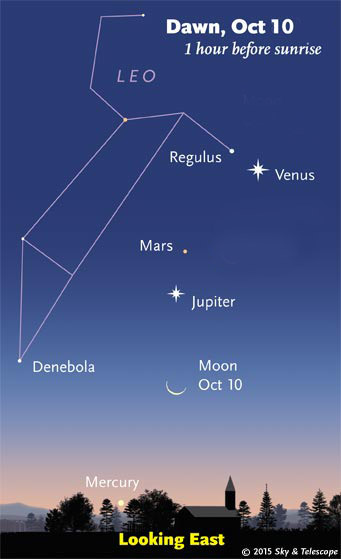 Look above the waxing gibbous Moon this evening for Regulus, as shown here. 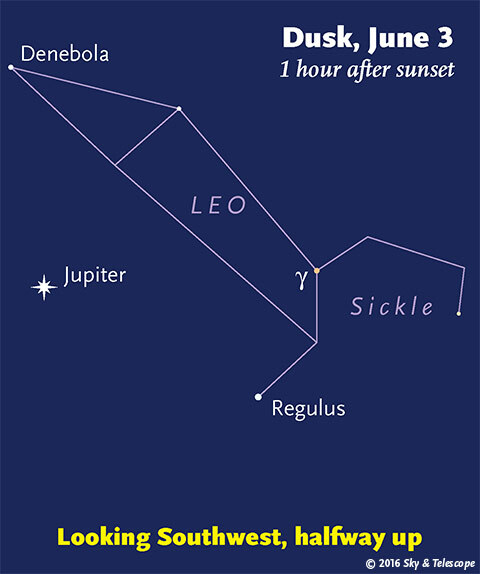 The Sickle of Leo extends nearly upright from Regulus. 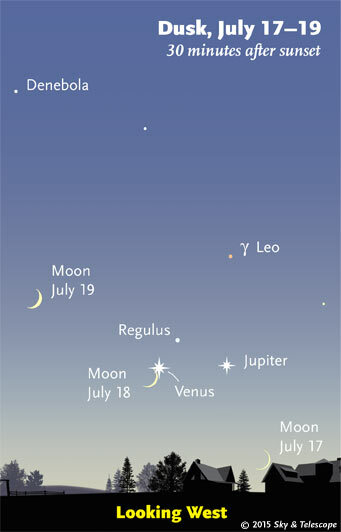 The waxing gibbous Moon shines under Leo tonight. 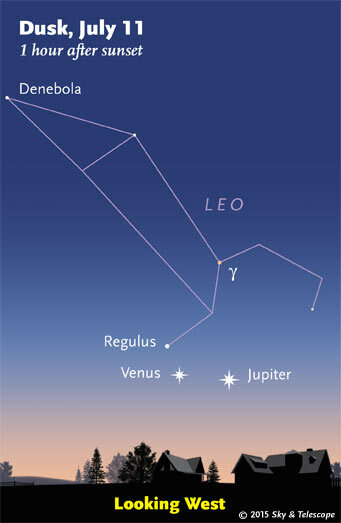 Leo is where you get if you follow the pointer stars of the Big Dipper far enough backward. 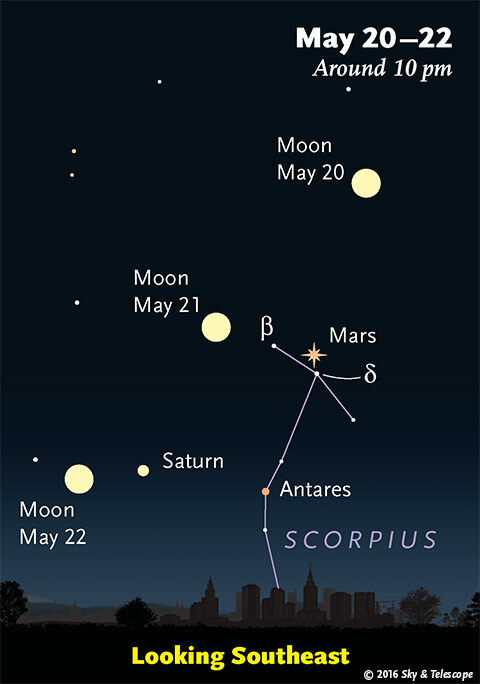 This evening, look far lower left of the waxing gibbous Moon for fiery, glary Mars. 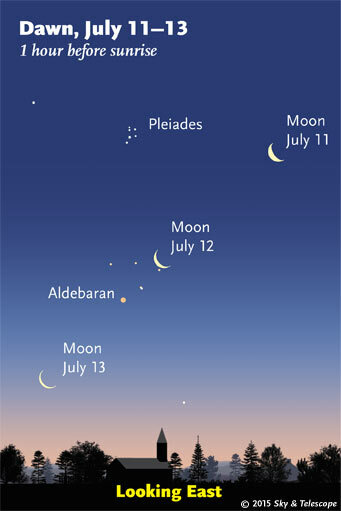 By about midnight they're lined up horizontally in the south. 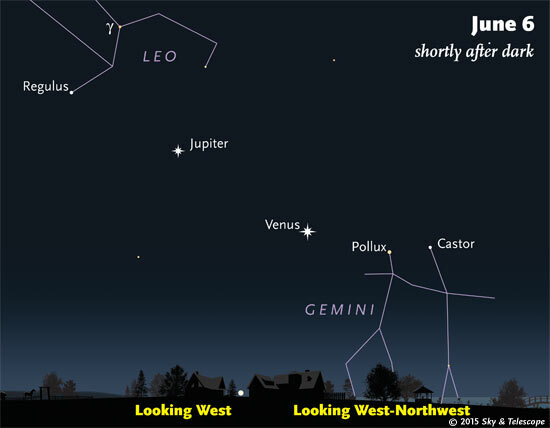 Vesta, the brightest asteroid, is at opposition. 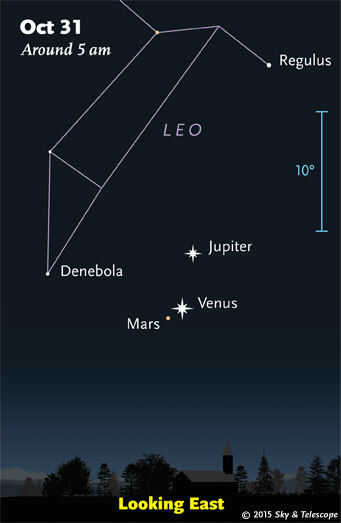 Ceres, the biggest asteroid, is just 2½° from Vesta and only 2 days from opposition. 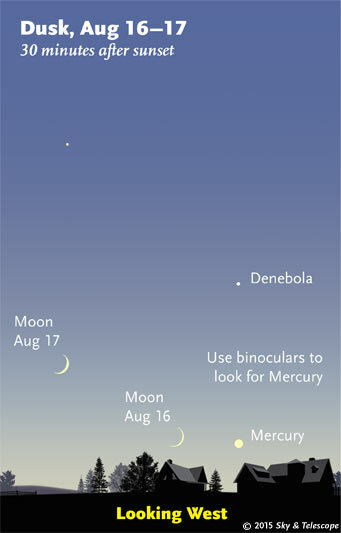 They're in Virgo, easy in binoculars at magnitudes 5.8 and 7.0, respectively. 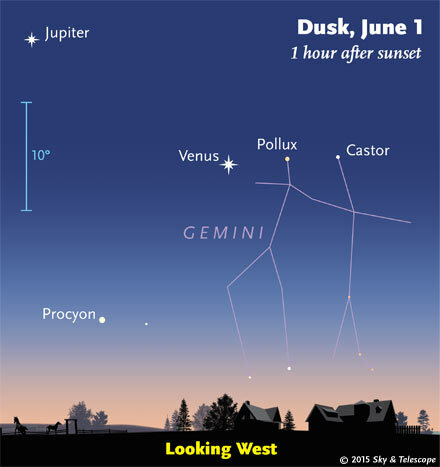 Use our finder chart for Ceres and Vesta (click the link in the text for printable finder chart for "Ceres and Vesta in 2014"). 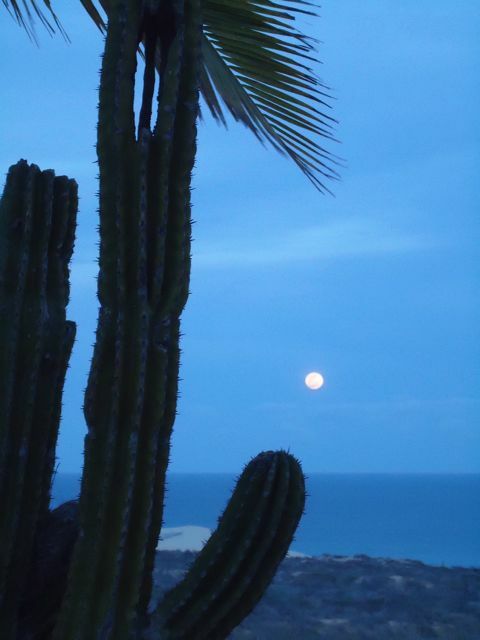 A total lunar eclipse happens very late tonight for the Americas! 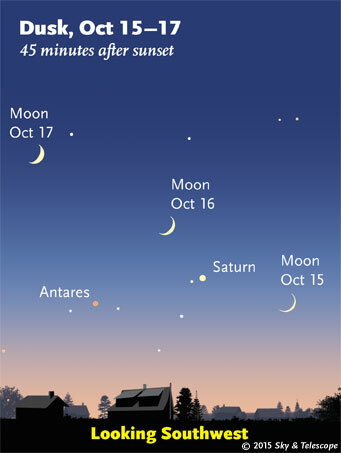 See April's Total Eclipse of the Moon with map and timetable (also in the April Sky & Telescope, page 60). Aligning his camera on the same star for nine successive exposures, Sky & Telescope contributing photographer Akira Fujii captured this record of the Moon’s progress through Earth’s shadow for several hours around the eclipse of July 16, 2000. 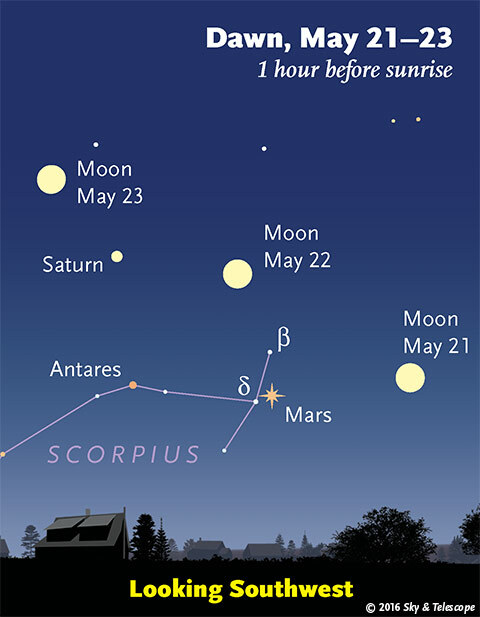 Meanwhile Mars shines near the Moon all night, and Mars is at its closest to Earth tonight. 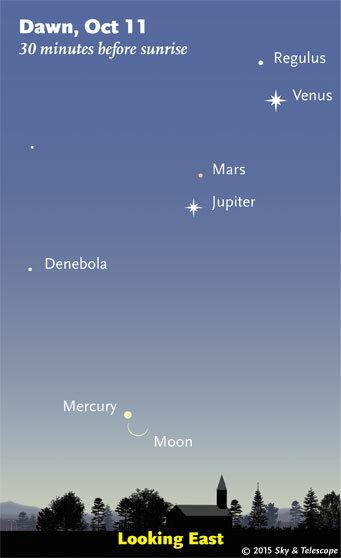 And in addition, Spica shines much closer to the Moon than Mars does (for the Americas). 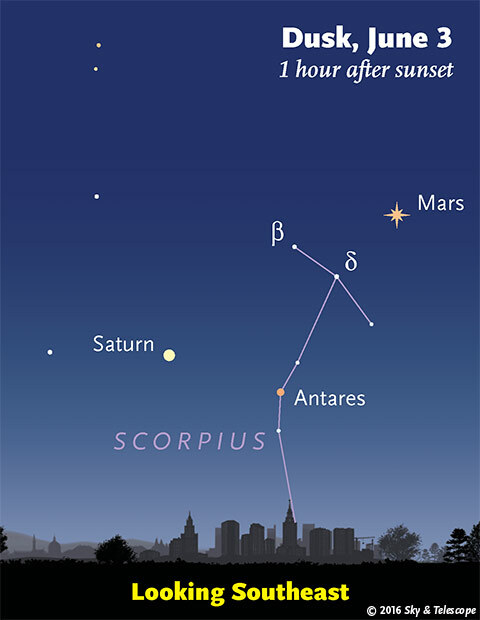 After dark, look east for the lineup of Mars, Spica, and the just-past-full Moon, in that order from top down. 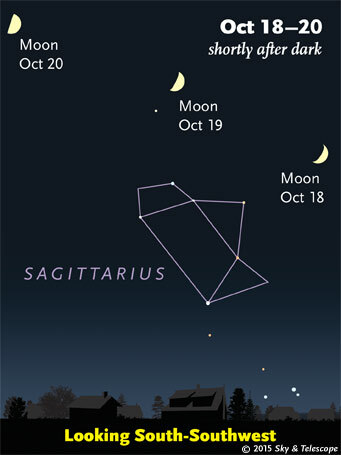 The waning gibbous Moon rises soon after dark with Saturn hanging right close by. 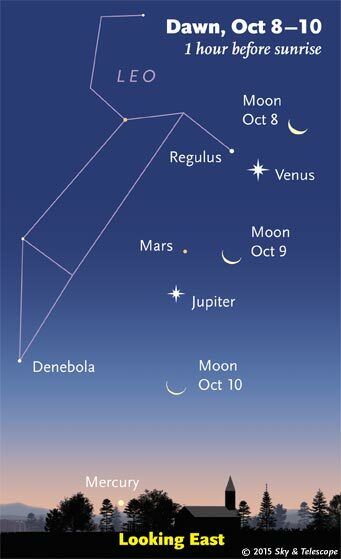 Watch them cross the sky together for the rest of the night. 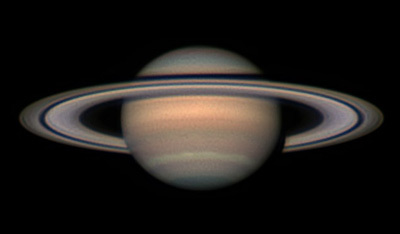 The Moon occults (covers) Saturn for southern South America; map and timetable. 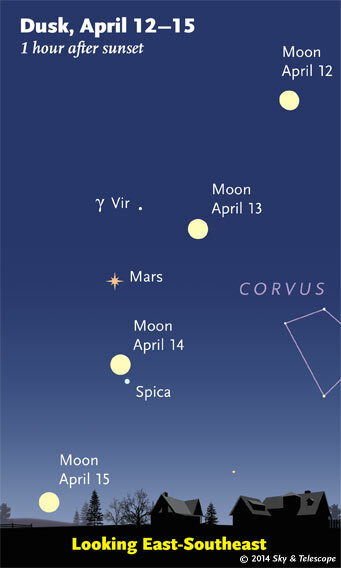 Watch the bright Moon march past Mars and Spica at dusk. Ganymede, the largest satellite of Jupiter, emerges from behind Jupiter's eastern limb around 10:18 p.m. Eastern Daylight Time. 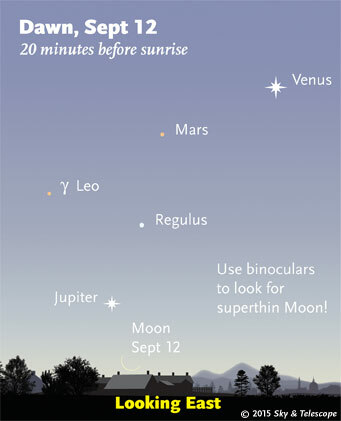 It disappears into eclipse by Jupiter's shadow around 12:06 a.m. EDT, then reappears around 3:29 a.m. EDT. 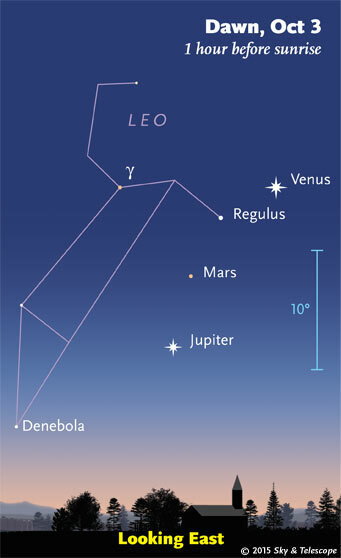 Jupiter shines right under the big Arch of Spring this year. The Arch spans much of the western sky. 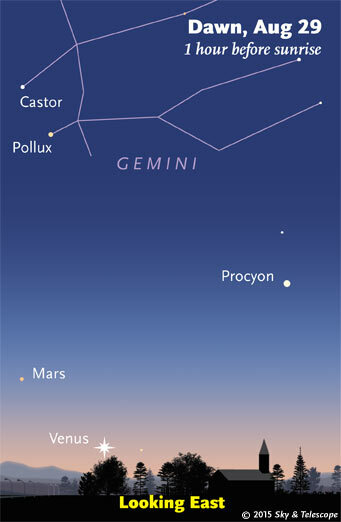 Pollux and Castor form its top (as seen from mid-northern latitudes). To their lower left is one end of the Arch, Procyon, and farther to their lower right is the other end, Capella. Have you said hello to Vega yet this year? 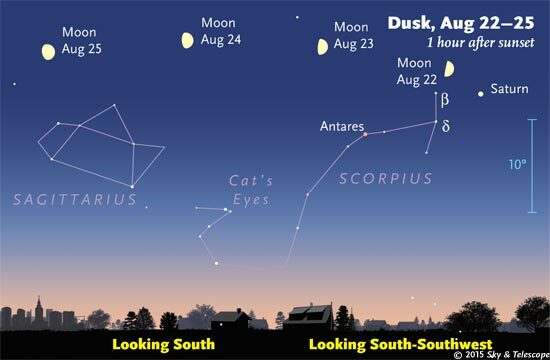 The "Summer Star" is now sparkling low in the northeast at nightfall. By dawn it's high overhead.